The very good news for expectant mothers is that your pregnancy does not have to bring your interest in fashion and sense of style to a dismal end. The reality is much to the contrary – much modern maternity wear is now incredibly stylish and on trend, so much so that you will feel as though your pregnancy actually enhances your sense of fashion and ability to dress creatively or follow the latest trends. Naturally, it is important to also feel comfortable in your clothing during pregnancy. Your body changes and is hard at work for these months as it grows and nurtures your baby and so it deserves to be comfortably, but also stylishly adorned. Today it is possible to wear the latest fashions in everything from maternity swimwear to maternity sleepwear. So, how can your maternity clothes enable you to be both fashion-forward and comfortable? No matter whether you are pregnant and have the need for maternity clothes over the summer or winter months, maternity dresses are an essential inclusion in your maternity wardrobe. As well as being one of the most comfortable articles of clothing to wear while pregnant, maternity dresses come in a range of close as well as loose fitting styles. We only have to think of women such as Nicole Ritchie, who has looked incredible throughout her two pregnancies and shown just how stylish dresses can be, to appreciate how versatile and contemporary maternity dresses can be. Of course, maternity dresses do not only come in casual styles. It is possible to purchase stylish and highly fashionable maternity evening dresses that will see you looking radiant at events such as weddings, balls, presentations and all sorts of functions. Pregnancy is absolutely no reason not to wear a gorgeous and very special dress. Think of Victoria Beckham at the royal wedding of Prince William and Catherine Middleton – her dress looked gorgeous and her pregnancy seemed only to enhance the sophisticated style that she exudes. Just as much of our non-pregnant wardrobe is made up of tops of different styles, varieties, patterns, prints and hues, so too should your maternity wardrobe be. Tops of different types bring variation and interest to the wardrobe of every woman and can be enhanced and featured in different ways through the use of accessories. Investing in tops that are specifically for maternity wear is a great idea. You will find that your body grows and changes shape during pregnancy and wearing tops that accommodate and flatter your changing form will help you to look and feel great. Consider maternity t-shirts, shirts, long sleeved tops, tanks, cardigans, jumpers, jackets and special ‘dressed-up’ tops for your maternity wardrobe. If ever there was a garment that pregnant women recommend as a piece of maternity wear that is both stylish and comfortable, it would have to be maternity jeans. Not only do maternity jeans generally look great and help a woman to feel comfortable because they are tailored to fit and accommodate the growing and changing body of the pregnant female, a number of designers now create their own versions of maternity jeans that are fashion forward and incredibly stylish and flattering. In fact, such maternity jeans often make a woman feel as though her sense of style and fashion is enhanced rather than suppressed during her pregnancy. It is definitely possible to dress stylishly and comfortably during pregnancy. Pregnancy no longer means that you need to fore-go your sense of style as you can now take pride and be creative with what you wear in the months leading up to your baby’s arrival. Looking effervescent and every bit the excited mum-to-be, Hillary Scott of American country pop music group “Lady Antebellum” arrived at the 2013 ACM Awards. It’s generally well-known these days that moderate physical activity provides many benefits during pregnancy. Exercise can improve your strength, posture, sleep and circulation, help control weight, give you more energy and some relief from stress, boost your moods, and it can have social benefits as well. It may also help you cope better with your labour when it comes, and get back to normal more quickly afterwards. 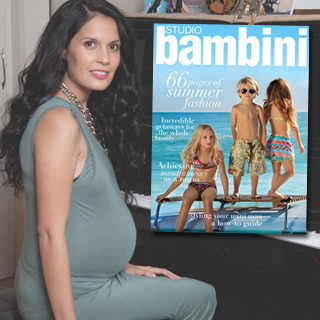 The Summer 14/15 edition of Studio Bambini features loads of Queen Bee fashion plus a quick ten minute interview with the founders.